KEEP PRECIOUS MEMORIES FOREVER! Keep track of your little one's ‘firsts’ in a premium baby journal! 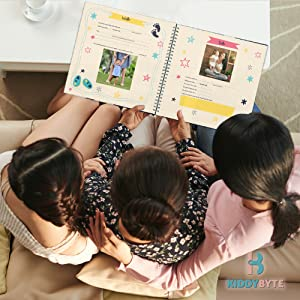 Make your personalized record of the baby’s pictures, milestones, keepsakes, likes & dislikes in this cute baby scrapbook album to keep the memories alive forever! HIGH QUALITY & BEAUTIFUL DESIGN! Enjoy the fine, velvety paper and the non-predefined photo spaces offering you the flexibility for various photo sizes & format! 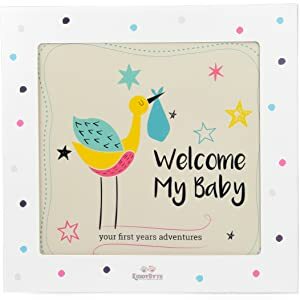 The content page, the monthly baby stickers (first 12 months), the baby keepsake envelope and the cute pictures make it the best boy or girl memory book on the market! PERFECT FOR ALL FAMILY TYPES! All parents are unique, and their love for their kids are unconditional! 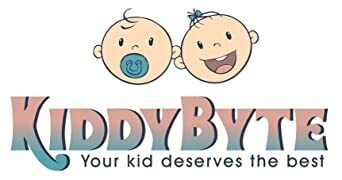 At KiddyByte we believe in that and we prove it, by designing our baby pictures album free of stereotyped layouts! This is why our first years baby book is perfect for traditional, single, adoptive or LGBT families! A SPECIAL GIFTING IDEA! Whether you are looking for an original baby shower gift, or a special present for the mom-to-be or the parents of the newborn, your search ends here! Offer them the cutest baby boy or girl baby journal rather than standard baby gifts and they will thank you for it! 100% SATISFACTION OR YOUR MONEY BACK! We take great pride in the quality and design of our baby pictures album and we are confident you will love it! This is why we are backing it with 100% KiddyByte Refund Policy, to help you buy with confidence! To us, YOUR satisfaction is top priority! Keep Your Baby’s First Amazing Feats Forever Alive! Do you wish you could capture your little angel’s first smile forever? Are you looking to take your newborn son’s or daughter’s first tummy time or wobbly steps? How about offering the expecting mom or the proud newborn parents an unforgettable gift? KiddyByte has designed with love and utmost attention to detail the most amazing baby memory book for the first 3 years of your little one's adventures! With so many choices of baby journal books on the market, we know your choice is made difficult! This is why we are offering you the BEST MIX OF QUALITY & DESIGN in a deluxe baby first years book that will host your kid’s precious ‘firsts’ in style! With the right amount of space for both text and photos, you will never be at a loss of words for what to write, or have insufficient space for important photos! Enjoy precious memories that you can revisit with your kids when they are older. It's a great way to bond as a family. Our KiddyByte baby memory book comes in a premium gift box, and makes an unforgettable and thoughtful gift. 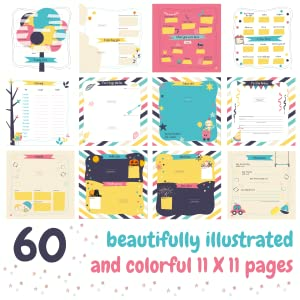 With 60 well illustrated pages, there is a space for each important milestone in your baby's first years. Our baby journals are made with respect to ALL family types and makes the ideal baby photo book to be offered as a baby shower gift or a special present to the future mom!